I may be alone in this, but... eating things with my hands (unless those things are fries) seriously stresses me out. I'm talking sandwiches, tacos, wraps, etc. Anyone else? Fillings dripping out, taking a bite & watching stuff fall out the other end (not to mention just having to put my hands all over my food)? No. Way too many variables when all I want is to chow down on some delicious eats when I'm hungry and just want to get the food in my belly. 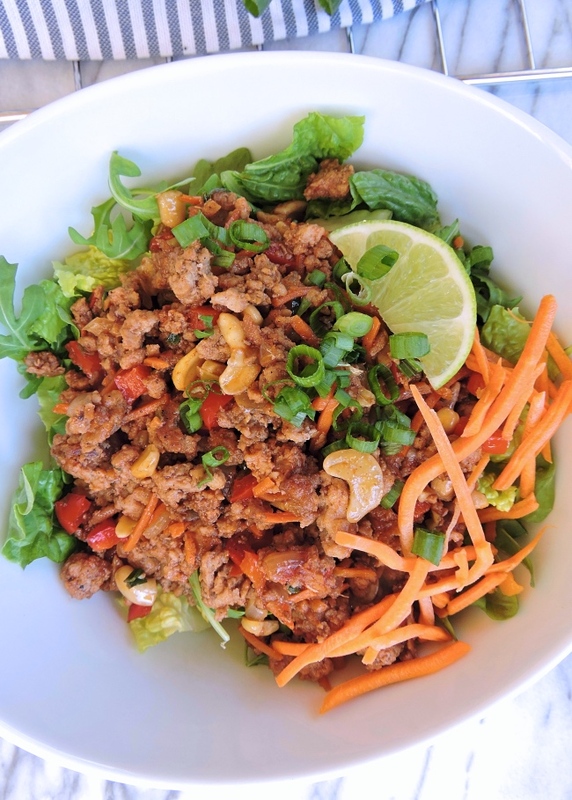 Of course, when it comes to Asian-style lettuce wraps, the flavors are just too good to pass up. 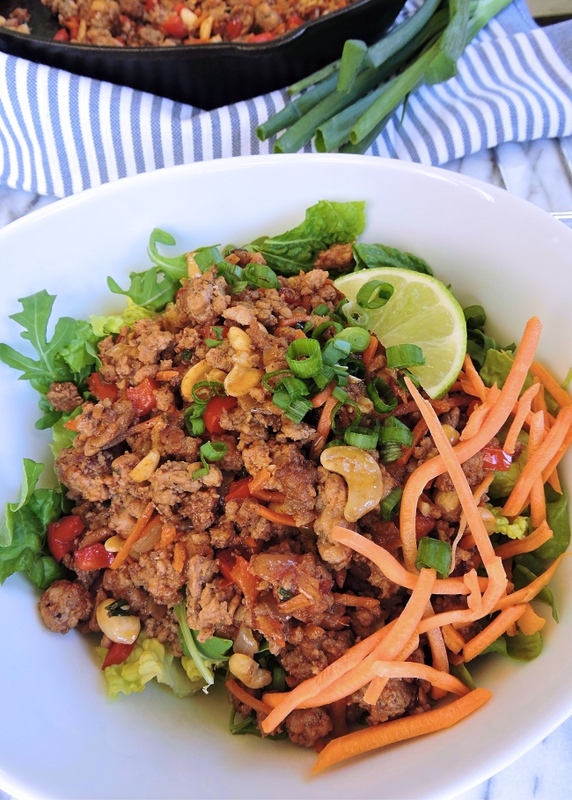 Savory sautéed pork (or chicken if you prefer) with crunchy cashews, tender chopped veggies, green onion, and a delicious sweet-savory sauce with ginger and garlic... Like I said - too good! So while you can absolutely make this delicious filling & serve it traditional lettuce-wrap style, I go ahead and chop that lettuce and make these into some crunchy-fresh BOWLS. Because while I'm not a wrap girl, I am a filling girl. This mix is sure to fill you up AND please a crowd. It's also an awesome meal prep dish! Make a batch of filling and use it different ways throughout the week. Hope you enjoy this tasty dish as much as we do! In a large skillet, heat the coconut oil over medium. Add the pork, white onion, ginger, and garlic, breaking up the pork into crumbles as it cooks. Sauté for 6 to 7 minutes, until the pork is almost browned through. 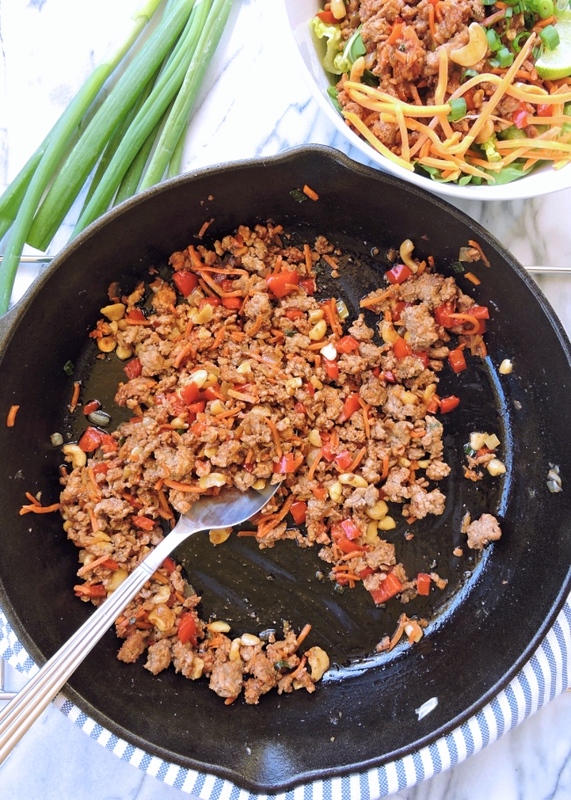 Add the green onion, bell pepper, carrot, and cashews. Sauté until the vegetables are tender, about 5 minutes. Stir in the coconut aminos, tomato paste, and seasonings and simmer until warmed through. Serve over a bed of greens or wrapped in lettuce leaves, topped with chopped fresh herbs & a squeeze of lime. 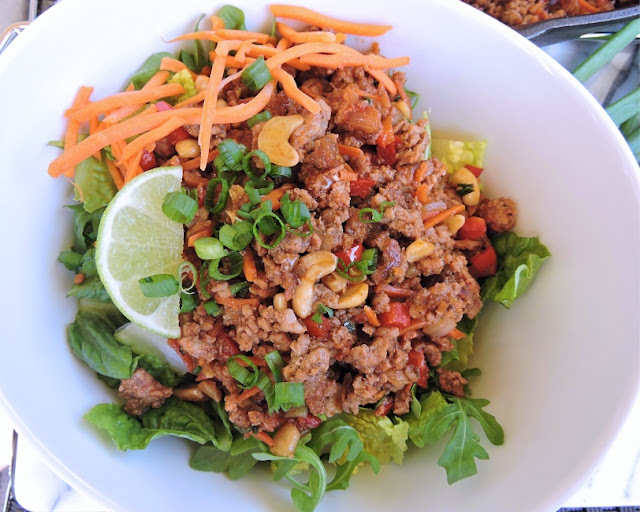 If you're not a fan of ground pork or don't have access to any, you could substitute ground chicken or turkey for a similar flavor. Looks great when my honey gets back from Hong Kong I'll make it for her! As always thanks for the wonderful ideas and recipes. Personally, I love eating with my hands! All of your recipes look delish! Do you think this would freeze okay? I have a little one arriving in March and would love to stock the freezer. Thanks! Hi! Yes, I think it would be just fine in the freezer!